Google Chromecast is practically considered as one of the best gadgets to have released in the recent years. 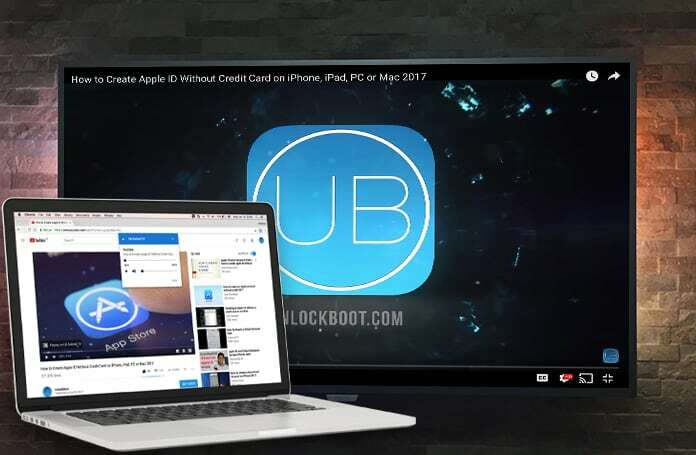 This affordable dongle has the ability to turn any television into a smart television, which can enable you to easily watch YouTube or Netflix on the big screen, controlling it using your smartphone. That isn’t the only capability that it has, there are a lot of other reasons that would make you love Chromecast. Through it, you can cast any music, videos, or photographs to the big screen from your Mac’s hard drive. You just need to be aware of the tools and apps that can do it. Google Chrome Cast: It does not really make a difference if you have the new Chromecast 2.0 or the original one because both of them have a similar functionality for Mac. New users need to learn how to use Chromecast. Mac PC: It hasn’t been tested with Hackintosh builds, but it should be able to work properly on this too. An active Wi-Fi Connection: It should be made sure of that the Chromecast and Mac are connected to a similar Wi-Fi connection and that none of them is running on VPN. 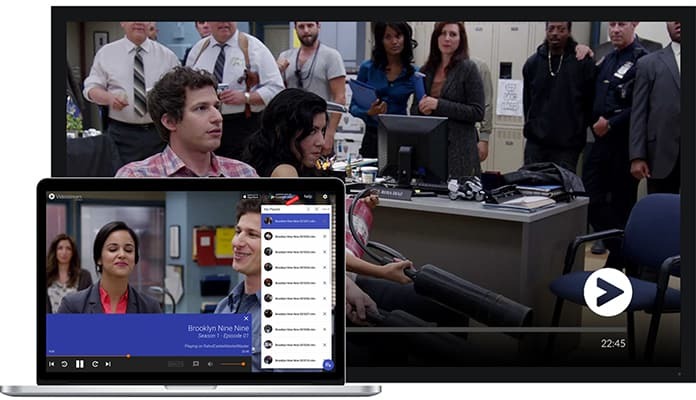 Chromecast and Chrome extension: Although it is not really needed for a lot of things, it will help you have a browser tool for Chrome and Chromecast. Since movies is what Chromecast specializes in, let us start with that. With movies that are hosted on the internet, Chromecast can be made into a media center for your television. Though it is a tad bit different for the files that are locally stored. In order to do this, check out these two apps. Airflow is the most simple and technically the best application to stream videos to Chromecast. This interface is extremely easy to use. In fact, you would be able to master it within a few seconds. All you have to do is select the right Chromecast, drag-and-drop or add your videos and click play. Airflow has no cost, plays a huge range of movie files and supports playlists with ease. Preview thumbnails are also visible on the playback bar, so you know which part of the movie you are skipping to. It supports surround sound, subtitles and hardware accelerated transcoding. The videos can be customized the way you want them to be. Airflow does not remember the last point of your playback because it is a missing companion application for mobile. If those videos are important then check out Videostream for Chromecast, which is a browser based application for Chrome. Videostream is a free, premium application, boasting some free of cost features, while you would have to pay for some. The drawback of the free version is that you can’t change the subtitle’s appearance and make playlists. Other than that, it runs on Chrome, which is considered to be a poor browser by some people on OS X. Like every other laptop, MacBook has pretty low volume when it comes to its built-in speakers. Although there are a few ways to fix this agonizing problem, using external speakers or headphones is probably the best one. If the speakers connected to your TV are better than the one on your Mac, it would be wise to use that. As long as you are connected to Chromecast, your Mac audio can be easily streamed on the TV. Meaning you can use the music on your Mac’s iTunes and hear it through the speakers on your Television, or your top notch surround system speakers. Download and install Soundflower, which enables Mac applications to transfer their audio to other applications. Download and install Soundcast for free. Double click Soundcast’s ZIP file and extract the contents. Drag and drop it to your Applications folder. Double click the Soundcast app to run it. The Soundcast icon will now appear on your Mac OS menu. Click it to view the option Cast to, in the drop down menu. Select the most relevant Chromecast and you will be good to go. 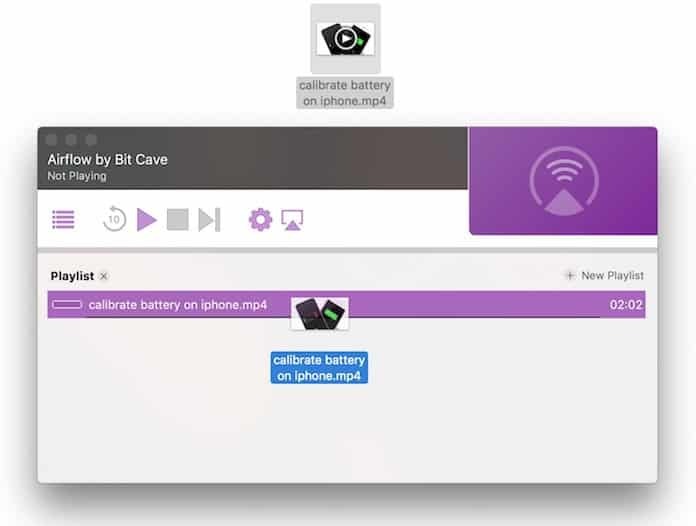 Now, you can play any audio from your Mac through your accessory speakers. Feel free to use whichever app you like, be it Spotify, Deezer, iTunes or any other browser. Sadly, the drawback of Soundcast is that it does not support lyrics or album art, so you’re going to have to live with that! Despite the fact that OS X has amazing new iPhoto’s for Mac, along with many other great photograph applications, unfortunately none of them supports Chromecast. In fact, there is no application available that can let you stream your photographs to the Television through Chromecast. In order to do this, you would need to get PictaCast, which is also a Chrome application. Basically, you’re stuck with this glitch, and there’s is nothing else that you can do about it. Download PicaCast and start the application. It isn’t difficult to get a hang of it at all. You can easily see two distinctive folders: Add Folder and Add Music. Add a track from your local music library by pointing at PictaCast. 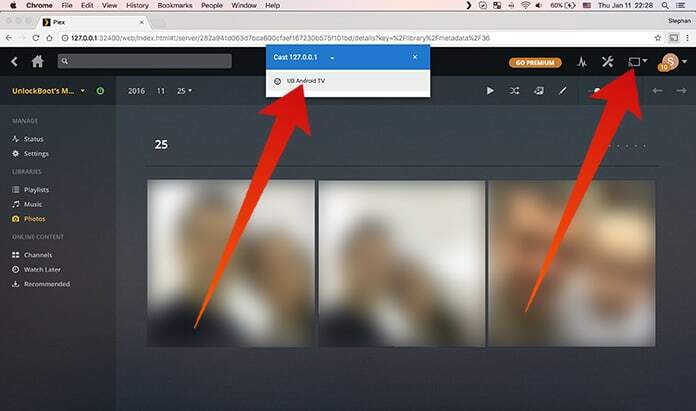 Choose the relevant Chromecast from the extensions and it will automatically start playing the images from your folder, on the Television. Surprisingly, PictaCast can be customized. The images can be set accordingly to fit the screen in the full screen mode. 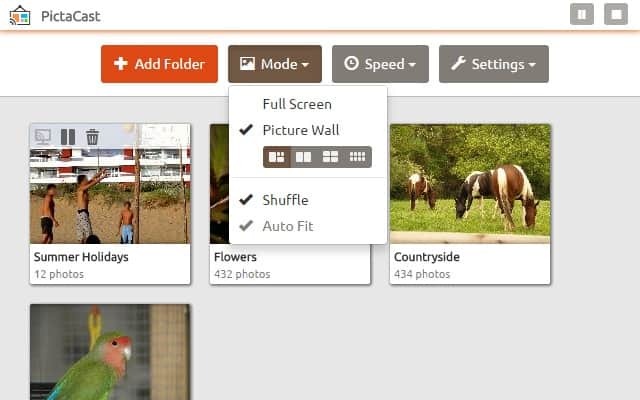 They can be shuffled in random orders or could be chosen from four different types of photo walls. The speed of the player can also be controlled, flip the pictures at the speed you want them to be at. There’s an option to rotate the screen and select the file and display name as well. Pictcast is a great way to share photos with your friends and family, by simply installing the application on your phone and adding the photographs. The free app has a restricted usage of only thirty minutes per day, while the paid version is unlimited. The above applications might be simpler to use, but if you have enough time on your hands, Plex would be better. It can manage videos, movies, music from a single application. Although it is a bit difficult to master, especially when you are technologically compromised. But it is worth the try! Myriad file formats are supported on Plex, making it work across platforms and it is also free for basic personal usage. It also has the ability to scrape things off of the internet to add things like album art, files, subtitles, lyrics and much more. By implementing these measures, you’d be able to case local media from your Mac to Chromecast. Feel free to leave comments if you don’t understand anything.